I’m a big fan of everyday carry, or EDC for short. I find it interesting to see what people carry with them on a daily basis such as wallets, keys, notebooks and the all important types of pens that they write with. While there are many options - including the extremely popular Fisher Space Pen - one of my favorite everyday carry pens falls into the gel ink category. The Pilot Hi-Tec-C pen has been a fan favorite for a long time and is even more popular especially due to the explosion of machined pen projects using these refills on Kickstarter. The dark line quality of the refill is superb and performs flawlessly time after time. The problem is that most Hi-Tec-C’s are not necessary portable to carry in your pocket. The Hi-Tec-C Slim Knock 04 solves this problem with a shorter and slimmer version that makes it ideal for anyone’s EDC. The Hi-Tec-C Slim Knock has a total length of 4.75 inches and the width of the barrel is narrower than a regular Hi-Tec-C. 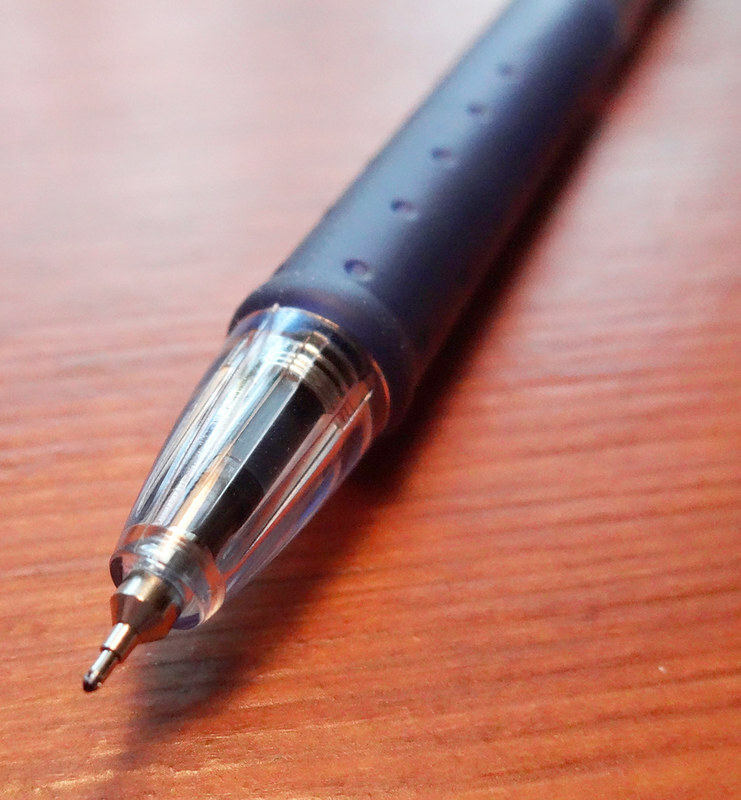 It has a comfortable rubber grip that covers nearly half of the pen. The pen also contains a sturdy metal clip that secures very well to shirts and pants pockets. This compact design is also retractable unlike the regular versions of the Hi-Tec-C. This is the one pen that’s always with me while out running errands, at work, or traveling. It’s perfect as an EDC pen because it’s quick to use to jot down notes on the go and is very portable. It writes a clean fine line that is great for small notebooks and journals. The Slim Knock’s size and lack of weight makes it ideal to carry because you don’t even feel it in your pocket. Just make sure you remember to take it out before it goes in the washer! One of the main drawbacks of the regular Hi-Tec-C is the constant need to prime the pen to get the ink moving through the tip. The Hi-Tec-C Slim Knock doesn’t have that problem at all. Once you extend the refill, you get the same quality dark line every time you move the tip across the page. There is no need to scribble several times on the page to wait for the ink to hit the paper. While the Slim Knock is a great pen, it isn’t without a few drawbacks. The short length of the pen may not appeal to some people who have larger hands. Second, the refill size of the Slim Knock is on the smaller side due to the length. This wouldn’t be the type of pen you would hand to a college student to use to take lengthy notes in class. It's not built for endurance writing - it’s made for taking short, quick notes. Another minor downside is that the Slim Knock pen and its larger counterpart are the same exact price on Jetpens at $3.30 each. The Slim Knock refills make up for it by only costing $1.35 compared to $2.20 for the regular. That is, unless you like blue black. Unfortunately, in both versions, the blue black refills are not available to purchase separately. I’m not sure why, but it would be great if you didn’t have to buy an entire new pen just to get this color. Minor issues aside, the Slim Knock is my ideal EDC pen that meets all my requirements and more. It’s always at my side ready to write the quick notes I need at a moments notice. 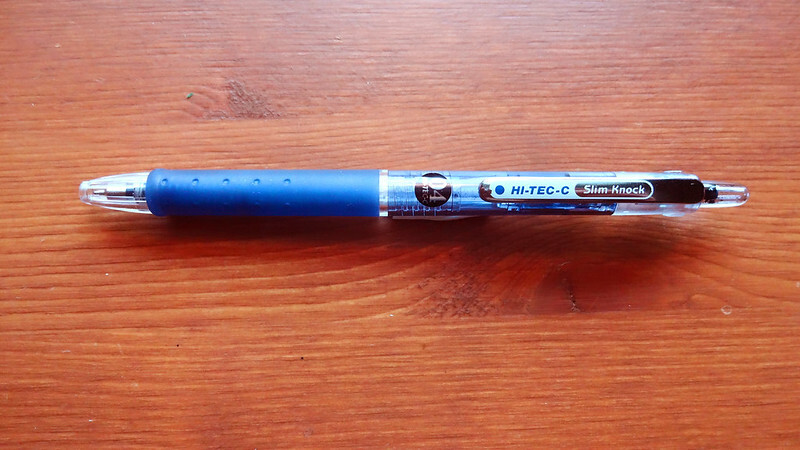 If anyone is looking for an EDC pen that is retractable and writes a fine quality gel ink line then I would definitely recommend the Pilot Hi-Tec-C Slim Knock. 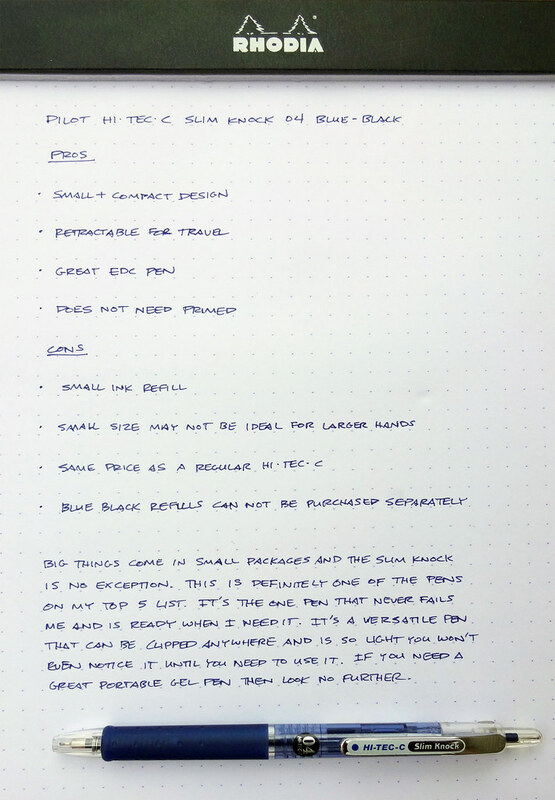 Posted on August 5, 2013 by Brad Dowdy and filed under Hi-Tec-C, Pen Reviews, Pilot.